The Mantis Shrimp, or stomatopod, has eyes that are compound, like those of the dragonfly, although they have a far smaller number of ommatidia (about 10.000 per eye); however, in the mantis shrimp each ommatidia row has a particular function. For example, some of them are used to detect light, others to detect color, etc. 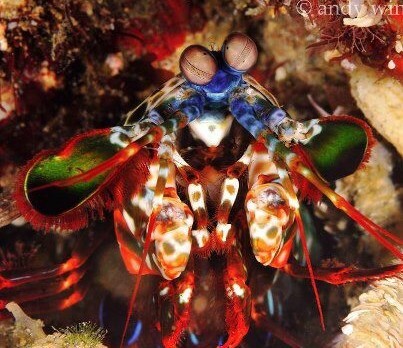 Mantis shrimp have much better color vision than humans (their eyes having 12 types of color receptors, whereas humans have only three), as well as ultraviolet, infrared and polarized light vision, thus having the most complex eyesight of any animal known. The eyes are located at the end of stalks, and can be moved independently from each other, rotating up to 70 degrees. Interestingly, the visual information is processed by the eyes themselves, not the brain. Even more bizarre; each of the mantis shrimp’s eyes is divided in three sections allowing the creature to see objects with three different parts of the same eye. In other words, each eye has “trinocular vision” and complete depth perception, meaning that if a mantis shrimp lost an eye, its remaining eye would still be able to judge depth and distance as well as a human with his two eyes. Scientists are only starting to understand the mysteries of Stomatopod vision; for the moment, we can only imagine what the world really looks like to a mantis shrimp. Seattle WA – Today two leading marine science and conservation organizations, the Marine Conservation Institute and Mission Blue, issued the 1st-ever quantitative, scientifically rigorous national ranking of states’ protection of their ocean waters. 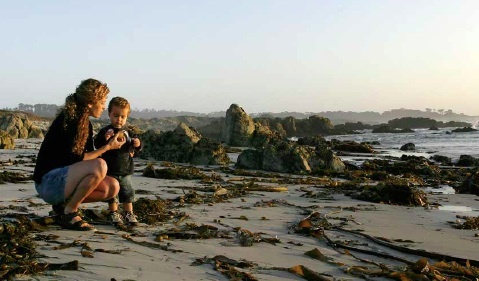 SeaStates: How Well Does Your State Protect Your Coastal Waters? shows that most states and territories are failing to safeguard our nation’s marine life, seafood and coasts. Oceans are crucial to our health and economy. Coastal counties include only 5.71% of the area in the lower 48 states but generate 35.54% of the Gross Domestic Product. Indeed, coastal counties generate $7,992 more GDP per person than inland and Great Lakes counties. “Despite so many threats to their health, states are failing to protect our ocean waters,” said Dr. Lance Morgan, President of the Marine Conservation Institute. “No-take marine protected areas are the gold-standard for healthy oceans, but far too few states and territories are designating them.” SeaStates measures the percentage of state’s waters they strongly protect. Being free from fishing, oil drilling and other extractive uses allows marine life in no-take marine reserves to thrive and recover their former abundance. That’s crucial because marine animals and plants maintain healthy oceans essential to people. As coastal areas face increasing overfishing and climate change, strong marine protected areas maintain biodiversity, fisheries and coastal economies. Dozens of studies show that no-take marine reserves provide more effective protection than weaker protected areas, often providing an overflow of marine life into surrounding waters. Many marine scientists recommend designating at least 20% of state waters as no-take areas as the best way to sustain ocean health. “Whether you love our oceans for their beauty, for their fishes and marine mammals or for generating half of the oxygen we breathe, you should want them to be strongly protected. But most states in this report get a score of zero and only a handful are protecting even 1%. That’s not good enough when our oceans are facing grave threats like overfishing and pollution. America’s oceans and people deserve better,” said eminent marine biologist and President of Mission Blue, Dr. Sylvia Earle. “The United States has a long way to go if we want to be a world-leader in marine conservation.” SeaStates shows that 15 coastal states (AL, AK, CT, DE, GA, LA, MD, MA, MS, NH, NJ, NY, RI, SC, TX) out of 23 have no (zero) no-take areas. Six states (FL, OR, WA, NC, VA, and ME) have designated barely 1% or much less of their coastal waters as no-take areas. Only 2 states strongly protect over 5% of their waters in no-take reserves. In a fantastic event last night at the Seattle Aquarium, Sylvia Earle and Greenpeace’s Phil Radford announced the Bering Sea Canyons as the official 19th Hope Spot. The event attracted a large turnout and impassioned speeches in defense of the new Hope Spot. 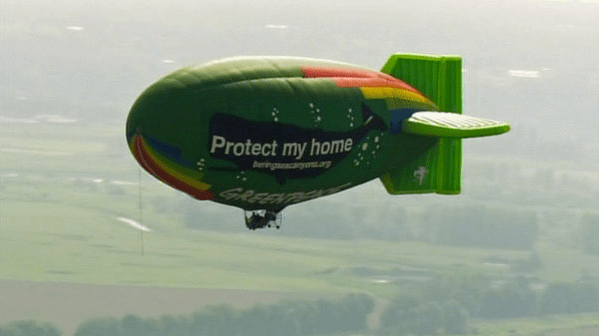 Moreover, a bonafide airship was in play to promote the event! The Bering Sea isn’t just chilly…it’s also super cool: these 770,000 square miles of tempestuous waters off the coast of Alaska and Siberia are home to immense populations of fish, seabirds, marine mammals and ancient corals, as well as the Bering Sea Canyons, the largest and deepest submarine canyons in the world — larger than the Grand Canyon. This rich ecosystem has supported indigenous tribes for thousands of years and currently provides over half the seafood caught in the United States. If half the total US catch sounds like a lot, that’s because it is. Sadly, under this enormous commercial pressure, the Bering Sea is in decline. Since the 1960’s, the region has seen steep declines in top predators — i.e. whales, sea lions, seals — with some populations dipping by over 80 percent of historic levels. Moreover, trawling nets are decimating ancient corals and sponges in the deep canyons, which are critical to the ecosystem and are hundreds to thousands of years old. 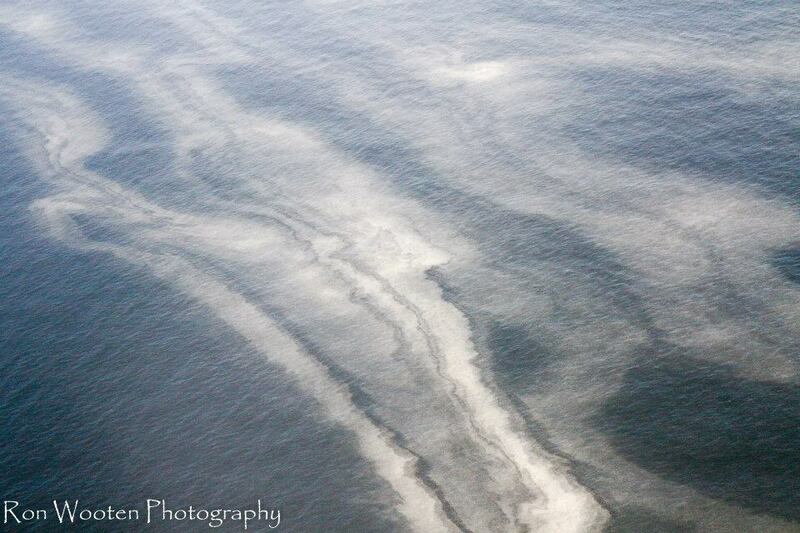 The Bering Sea was a rich ecosystem of harmony, and now it faces collapse due to the pressures of industrial fishing. The North Pacific Fishery Management Council is the steward of these precious waters and, as such, they must protect the sensitive habitats, so the Bering Sea can continue to be a flourishing ocean ecosystem into the future. With the global ocean in a general decline, the preservation of the Bering Sea as a Marine Protected Area — or Hope Spot — is critical. Please join your voice in this cause. Sign the Greenpeace petition to help protect the Bering Sea Canyons and reach out to support in any way you can. 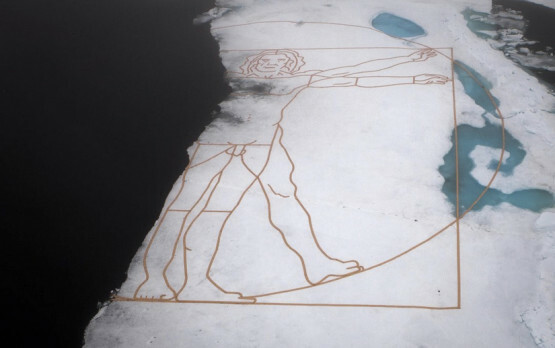 Constructed with copper banding, which was later removed and recycled, a team of Greenpeace activists laid out “Melting Vitruvian Man” on an ice sheet which was the size of four olympic-size swimming pools, following artist Quigley’s specifications. Using Greenpeace’s ice-breaker, the Arctic Sunrise, they travelled to a remote area 500 miles from the North Pole, after scouting for the perfect ice canvas from the air. The installation was created in the Fram Strait between Greenland and Norway’s Svalbard Islands. “We came here to create the ‘Melting Vitruvian Man’ … because climate change is literally eating into the body of our civilization,” said artist John Quigley. By now most of us have seen those feel-good television spots featuring a Louisianan, an Alabaman, a Mississippian and a Floridian, all smiling and boasting good-naturedly about the relative advantages of their home state as a tourist destination. With a clear emphasis on the many pleasures of the coastline of the Gulf of Mexico shared by all. The object is to draw visitors to spotless beaches and crystal waters, along with historical attractions, golf courses and, of course, food! Endless buffets of mouth-watering dishes served fresh from the bounty of the Gulf. 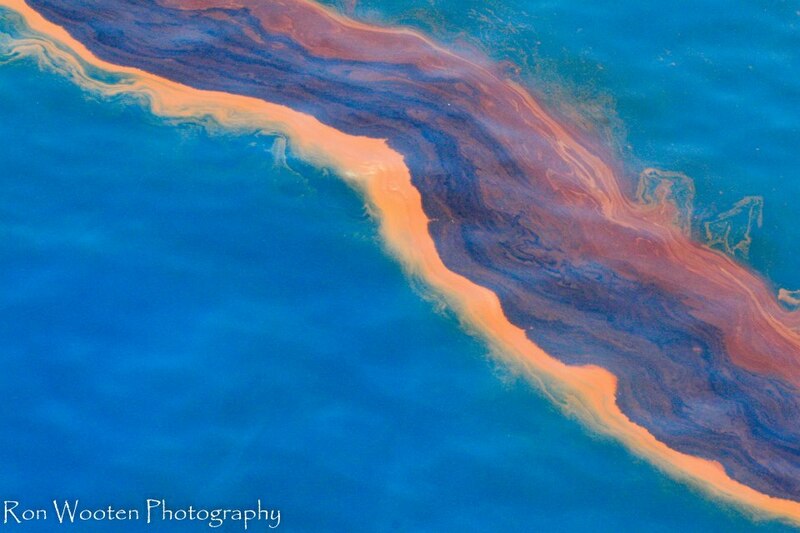 The message to prospective tourists is that the widely publicized miseries brought by the April 2010 BP spill are a thing of the distant past. A homegrown BP spokesman proclaims that things are better than ever, and urges one and all to come on down! 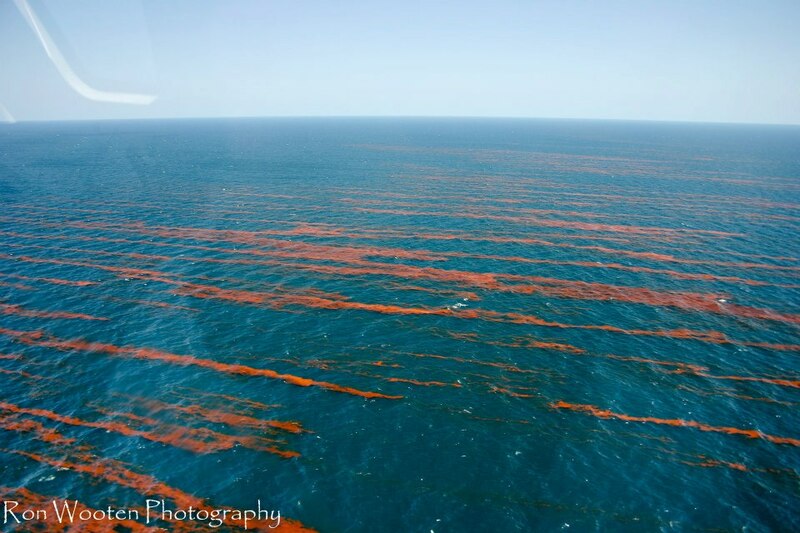 The ads are sponsored and paid for by BP, as part of its settlement for the harm caused to these same waters and fragile coastlines by the 2010 Macondo spill offshore Louisiana. And they’re very effective. We’d guess they’ve raised the visibility and favorable images of all four states by a measurable amount. 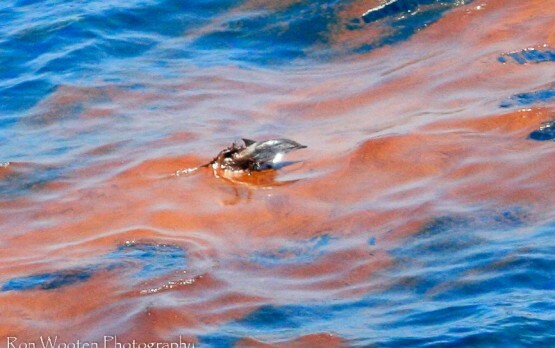 We don’t for a minute believe that the Macondo spill, which claimed 11 lives and spread its tarry mess across environmentally sensitive areas for hundreds of miles, was a good thing in any way, shape or form. It was a nightmare that must not be repeated. But we concede the spill may have served one unintended but constructive purpose: raising national and international awareness of the Gulf of Mexico’s many valuable uses – as home for a large and prosperous fishing industry, host to oil and gas rigs that supply 30 percent of our nation’s petroleum needs and not incidentally, as a place of subtle natural beauty that is attractive as a tourist destination. If our neighbors to the east get an economic boost from the BP ads, and the Gulf itself claims a place in more people’s minds, so much the better. Up to a point. That point is the one at which we make a 180-degree swivel to embrace the quite different views of oceanographer Sylvia Earle concerning these ads and the larger consequences of selling the Gulf to tourists. For more than half a century, Earle has served as the conscience of the Gulf. Explorer-in-residence at the National Geographic Society, the diminutive Earle is referred to by her legion of admirers as “Her Deepness,” for both her skills as an intrepid diver and her depth of thought about vital issues such as the long-term health of the Gulf and all of the world’s oceans. It would make the case for creating a national parks system in Gulf waters that would mirror those inspired on land by the likes of President Teddy Roosevelt and the conservationist/photographer John Muir. During the administration of George H.W. Bush, the small but biologically rich Flower Garden Banks 100 miles south of the Louisiana/Texas border were declared a marine sanctuary, and George W. Bush used his power as president to establish the largest area in the ocean where even the fish have a safe haven around the Northwestern Hawaiian Islands. It is an idea whose time has come. It would de-emphasize gorging on shrimp, tuna, grouper, snapper and other native Gulf species in favor of “fish watching,” a la the bird watching done on the North American flyway on the coast not far from Houston. It would make the case for giving what she calls the Great Blue Engine of the Gulf of Mexico a break from fishing and other extractive activities in special, vital areas. Giving back to the ecosystem that has given us so much. It would showcase the bigger picture: Nearly 60 percent of the freshwater rivers, streams and creeks in North America eventually flow into the Gulf – and that is not always a good thing. Agribusiness in the Midwest on a huge scale has yielded enormous deposits of fertilizer that create seasonal “dead zones” downstream at the mouth of the Mississippi. 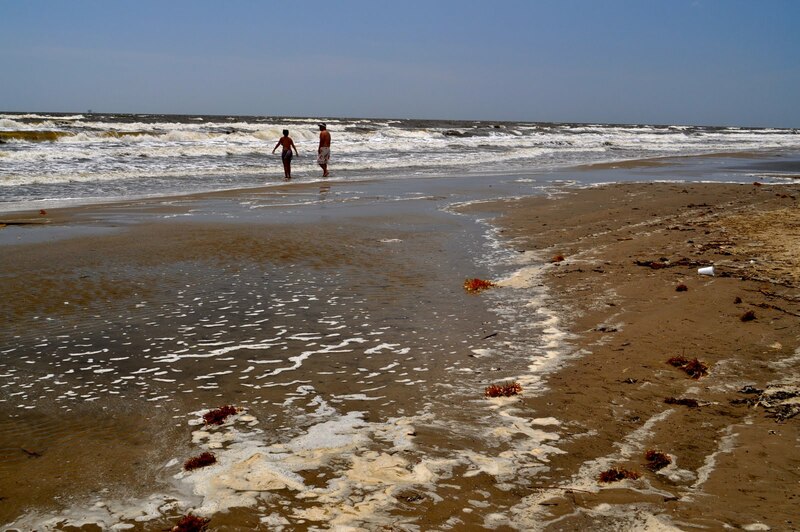 These dead zones could soon spread as far west as Galveston Bay, harming highly valued recreational and fishing resources in this area. We could elaborate. But Earle’s reputation speaks for itself. And she speaks ably in defense of the health of the Gulf of Mexico. Through her work with the National Geographic Society and her association with the Harte Research Institute for the Gulf of Mexico at Texas A&M Corpus Christi, she already has a sizable megaphone with which to communicate needed warnings about the dangers facing our aquatic front porch. 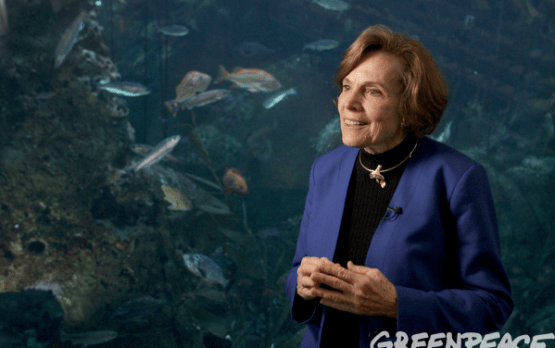 Wouldn’t it make for interesting viewing if BP chose to do a series of commercials featuring Sylvia Earle and some of her warnings about the Gulf? We think so. In the interests of full disclosure about the problems still facing the Gulf of Mexico, those views deserve the kind of prime-time television platform a BP-sponsored ad campaign would offer. What say, BP?